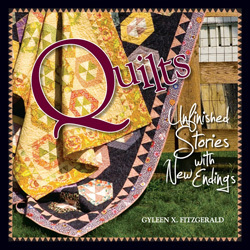 Quilts: Unfinished Stories with New Endings Quilts: Unfinished Stories with New Endings by Gyleen X. Fitzgerald. Is a quilter's journey to finishing antique textiles, from blocks to tops to quilts. Be inspired to use today's fabric to complete and provide a contemporary essence to what was started in 1930s' or 40s'. Stunning photo-essay of seventeen completed vintage quilts, instructions to recreate ten quilts and lots of how to information. "As I look at my vintage collection I ask myself if I can pay homage to those quilters I so admire by finishing what they started? Is it possible to add my style of simple lines, contemporary fabric and unexpected color blending without compromising the original intent?" It's a tall order and I love challenges. Come and join me on the journey to finishing.